THE EARTHQUAKE OF 28 FEBRUARY 2001 IN THE STATE OF WASHINGTON, U.S.
On 28 February 2001, a strong earthquake occurred in the State of Washington, U.S.. The quake was the most powerful to strike this region since 1949. 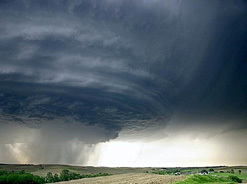 It did not result in any deaths but it caused significant property damage. According to the USGS's National Earthquake Information Center (NEIC), the earthquake had a magnitude of 6.8. Its origin time was 10:54:32 AM Pacific Standard Time (PST) , Wednesday, February 28, 2001 (18:54:32 UTC). It occurred near the Seattle - Tacoma area, with epicenter at 47.2 N 122.7 W, approximately 11 miles ( 20 km) NE of Olympia, 15 miles (24 km) from Tacoma, and 36 miles( 57 km) from Seattle. The epicenter was very near to that of the 7.1 magnitude, April 13, 1949 quake. The focal depth was 52.4 km (32.6 miles). Quake intensity in the immediate epicentral region was much as IX or X on the Modified Mercalli Scale. Ground motions were felt as far away as Salt Lake City. Numerous aftershocks followed the main quake. The quake was the worst in 52 years, with only one third the energy of the 1949 event. 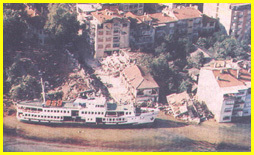 Because of its depth (52.4 km), its destructiveness was not extensive. It did not result in any deaths but at least 250 people were injured in the Olympia-Seattle area. There was no damage to bridges but strong ground motions toppled walls, rocked skyscrapers and ignited fires. U.S. Highway 101 buckled in several places. There was temporary loss of power throughout the affected region and the Seattle-Tacoma International Airport was closed for several hours. The Pacific Northwest is a region of geologic instability controlled by the convergence and collision of the northeast-moving Juan de Fuca Plate pushing into the North American Plate along the tectonic boundary known as the Cascadia Subduction Zone. This zone is the the most extensive fault system in the Pacific Northwest. It lies offshore and runs for about 1,000 km (600-miles) from British Columbia to northern California. The two tectonic plates converge at a rate of about 3-4 cm/year (1-2 inches/year), which causes stresses to accumulate along different, but parallel, seismic belts. Abrupt releases of slowly accumulated stresses along the Cascadia Subduction Zone have been responsible for major, shallow earthquakes in the region in the past. Although rare, quakes along this zone constitute the greatest threat for the Pacific Northwest. They are known as megathrust events. The second source for damaging earthquakes in the region is that known as the Benioff Zone. 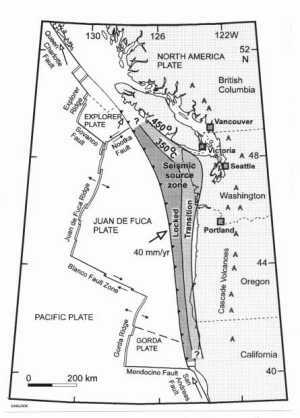 It parallels the offshore Cascadia Subduction Zone and it is the continuation of extensive faulting that results from the same subducting San Juan de Fuca plate as it forces further its way into the earth's upper mantle, underneath the North American plate. The Benioff Zone can probably produce earthquakes with magnitudes as large as 7.5 , most having focal depths deeper than 30 km. A third source for shallow crustal earthquake activity (depths of 0 to 20 km) in the Pacific Northwest occurs within the North American continental plate itself where surface faulting is extensive due to crustal buckling. Past earthquake activity has revealed many shallow fault structures, including the Western Rainier Seismic Zone and the Mt. St. Helen's Seismic Zone. One of the best known crustal faults is the Seattle Fault, which runs east-west through Seattle from Issaquah to Bremerton. Geologic evidence reveals that this fault was responsible for a very large earthquake approximately 1100 years ago. The U.S. Geological Survey has mapped several other crustal faults in the Puget Basin region, some of which have not generated earthquakes in recent geologic time. It is suspected that many more, still unknown, faults exist in the region. Crossection of the Subducting Juan De Fuca Plate showing the distribution of deeper earthquake hypocenters (and temperatures) along the Benioff zone and the shallower hypocenters on the northern extensions of the Western Rainier and Mt. St. Helen's Seismic Zones. On the basis of recently found geological evidence (paleo-tsunami deposits and submerged ghost forests inside areas that are now tidal marshes) - extensively spread over large areas of the Pacific Northwest - claims have been made that great earthquakes (with magnitude of as much as 8 to 9) and very long ruptures (of as much as 1,000 Km or more) must have occurred along Cascadia's Pacific coast . Further claims have been made that such earthquakes have repeatedly struck the Pacific Northwest in the past several thousand years - the most recent about 300 years ago, on January 26, 1700. Whether the Cascadia Subduction Zone can indeed generate earthquakes of such great magnitudes and ruptures is not known with certainty. 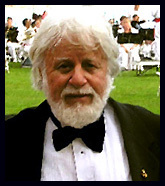 The Zone has been relatively quiet for many years. Whether it is locked - as claimed - or "lubricated" by sediments from the Columbia river, is not known. Although no "great" earthquakes have occurred since 1700 on the Cascadia megathrust , more than 1000 earthquakes of much lesser magnitudes occur each year in the inland Pacific Northwest region. Most of these are too small and only about a dozen are large enough to be felt. However, since 1872, there have been about 25 damaging earthquakes. In the 20th century, about 17 people have lost their lives from the larger events. The following table lists historical earthquakes of magnitude 5 or greater that have occurred near Puget Sound or Portland since 1877. Most of the events were associated with deep Benioff zone earthquake activity (deeper focal depth). The 1995 and 1996 quakes were the only exceptions in that they were shallow crustal events. According to recent reports the earthquake risk for the Pacific Northwest is much greater than what was previously assessed. As reported above, claims have been made that earthquakes with moment magnitudes of 8 or 9 occur along the Cascadia Subduction Zone (Cascadia Megathrust). Recent geological studies have concluded that 13 great earthquakes (known as megathrust events with magnitudes of 8 to 9) have occurred along the Cascadia Subduction Zone in the last 6000 years. If indeed such rare great, shallow earthquakes occur as postulated, they are capable of releasing 30 to 1,000 times more energy than quakes of magnitude 7. If they recur - as claimed - along the Cascadia's Subduction Zone, they will be by far more destructive than the inland earthquakes of February 28, 2001, the 1949, or 1965 (in the Seattle-Tacoma- Puget Sound area). Also, the Seattle Fault and the Portland Hills Fault are two major faults near large metropolitan areas with the potential of producing damaging earthquakes of up to 7 or even 7.5 in magnitude. In response to this potential threat, the Uniform Building Code was revised in 1994 for the states of Washington and Oregon. This revision of the Code was an important first step toward meeting the purported great earthquake threat in the Pacific Northwest. The new Code has extended the higher level hazard zoning to include parts of Washington and Oregon that are near potential sources of great earthquakes. All new structures are now designed to resist earthquake forces 50% stronger than they were under the old code. The Tsunami Risk of the Pacific Northwest. The February 28, 2001 earthquake did not produce a noticeable tsunami in Puget Sound or on the open coast because of its deeper focus and because it occurred inland, along the Benioff seismic zone. Earthquakes in the Benioff zone do not produce tsunamis of any significance. However, surface seismic waves can induce seiche activity within Puget Sound itself. Also, surface waves can induce ground liquefaction of heavily sedimented coastal areas of Puget Sound and thus trigger subearial or subaqueous landslides which, in turn, can generate destructive waves. 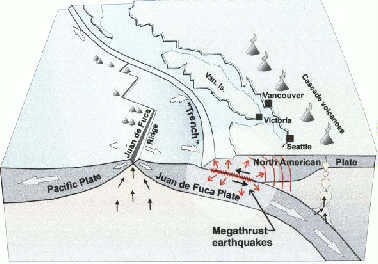 Major, shallow earthquakes occurring on the Seattle Fault, have also the potential to generate damaging tsunami activity within Puget Sound - although shallow crustal events, the earthquakes of 1995 and 1996 - in the Seattle/Tacoma area - had magnitudes (5 and 5.1 respectively) which were too low for tsunami generation. Past earthquakes along the Cascadia Subduction Zone probably generated significant tsunamis along the coastal areas of Vancouver, Washington, Oregon, and northern California. The most significant of these was presumably the one generated by a megathrust event on the Cascadia Subduction Zone more than 300 years ago, sometime in the winter in late 1699 or early 1700. According to some scientists this Cascadia earthquake generated a Pacific-wide tsunami that was destructive in Japan. Whether there is indeed a connection between the earthquake in Cascadia and the tsunami in Japan has not been established with certainty because no tsunami was observed or reported anywhere else. It is very possible that the observed tsunami in Japan had a different source. Future megathrust quakes on the Cascadia Subduction Zone can be expected to involve large vertical crustal displacements of the ocean floor along an offshore rupture zone which may be extensive - depending on the magnitude of the earthquake. However, it should be pointed out that the Cascadia Subduction Zone is highly fragmented and this may limit rupture lengths and earthquake magnitudes. Thus, major earthquakes in the region are possible and have the potential of generating destructive tsunamis which could affect the entire coastal area from British Columbia to northern California, as well as Puget Sound. For example, even an intermediate size earthquake on the southern segment of the Cascadia Subduction Zone could result in a local tsunami which could be somewhat damaging not only in Washington and Oregon but , particularly at Humboldt and Del Norte Counties in Northern California. Coastal towns like Eureka, Arcata, Petrolia, Fortuna and Crescent City could definitely be affected. Tsunami waves would reach coastal communities in Vancouver Island and in Washington, Oregon and northern California within minutes after an earthquake, most likely without warning (Pararas-Carayannis 2000). It is difficult to estimate the recurrence interval of tsunamis since larger earthquakes on the Cascadia Megathrust are infrequent. Most of the recent earthquakes which occurred somewhat west of the Cascadia Subduction Zone, had magnitudes of about 7.2 and generated relatively small local tsunamis.